Choose One - Give each player a Mana Crystal; or Each player draws a card. Likes: Hiking and the great outdoors. Dislikes: Goblin shredders and sandals. (Can’t find any that fit!). I don't get the flavour text. What she can't find any that fit: shredders or sandals? I guess she doesn't come out of a shredder as a 3 drop? I really have no clue. The minion is a driad. This unit was present in Warcraf 3 game. When this unit is created, she says "Oh, the great outdoors!". Sandals: she has hoofs, so can't find sandals which would fit her. Shredders: the driads protect the wild and forests; shredders in Wacraft are goblin machines, they look like a human-shaped robots with a circular saw on the end of their "hands", shredders are used to cut the trees. And driads protect the forest and trees, so they don't like shredders. Also they cant mount any shredder because of their body. it refers to that. So they can't find sandals to wear and shredders to mount. It does benefit your better but you paid 3 for a 2/4. 2/4 is 2 drop stats. I think this might be an all-around good card. Giving your opponent an extra mana may throw off their curve a little bit, but it might also lead to them actually having a play when it was non-existent at first. I'm trying it now in a weird Dragon Egg/Defender of Argus/Druid of the Flame/Kel'Thuzad deck, and it's holding up so far. pensaer was known for making virtually the same comment on every card. It got on some people's nerves so much that they would down vote every comment he made, even when it was something other than him liking golden animation. Unsurprisingly, pensaer doesn't post here anymore. I feel like every ramp deck should be using this card. I've been playing it with very good success. It makes your ramp more reliable, and you can combo it on a 4 mana turn with wrath or hero power. 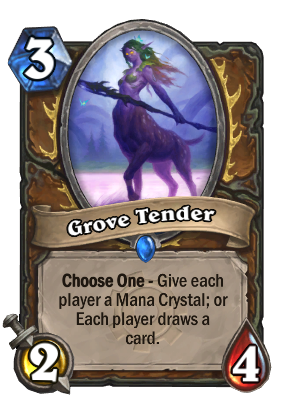 Beyond about 6 mana, I'll just save it for card draw - and for ramp druid with lots of heavies, the odds are you probably got a better card than your opponent. You just have to make sure to use this card wisely against agro decks. Giving a face hunter an extra card early, or giving a zoolock an extra mana crystal can be very dangerous. Choose One - Gain 1 Mana Crystal; or draw a card. I don't think that would be OP for a class-specific 4 drop. Why the hell are you upping the mana for no reason? If it's a 4 mana 2/4, those stats are underpowered and the card then needs to drop it symmetrical effect. How is that symmetrical? Lol. My bad, misread the post. The card is a calculated risk while giving you a decent body on the field. Against agro decks, you'll see your opponent running into card draw problems with that extra mana crystal. As long as you got an answer for their minions, you can proceed to run them over with a heavier deck. And then if you draw this guy late in the game at 10 mana, when you draw an Ancient of War, Loatheb or Dr Boom, while your opponent gets an undertaker, it puts you over the top. I'd watch out for this one, because the moment that druid has a 1-mana spell worth using, this card will look a lot better. Then you ask yourself how good could that 1 mana spell truly be? It's a 1 mana spell, reasonably, it wouldn't be too gamebreaking. ... You can just play a 2 drop and living roots then. You're paying 3 mana for a 2/4. 2/4 is pretty much just a 2 drop.